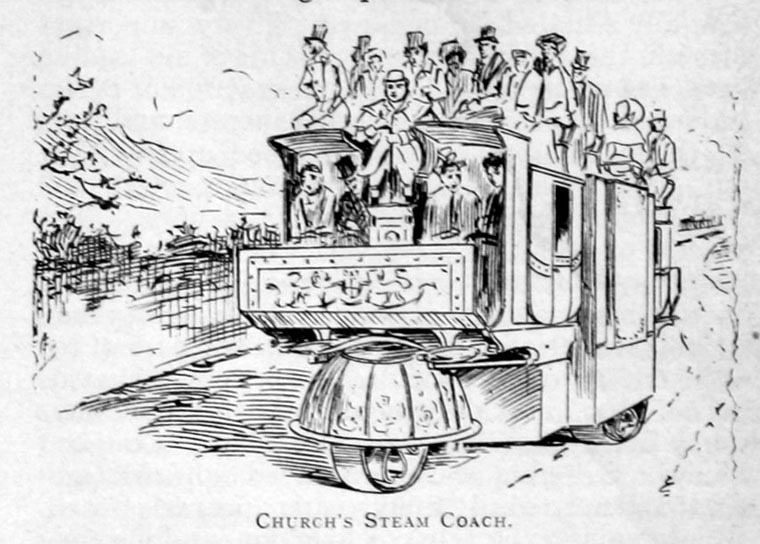 1896 Illustraion of Church's Steam Coach. 1818 Made a brief visit to England. 1822 Second visit to England to construct a printing press of his own design for 'Britannia', Lancaster Street. 1825 onward. Inventing and constructing machines for making spikes, nails, button shanks, hooks and eyes, etc. 1829 Letters Patent granting William Church of Haywood House, near Birmingham, esq., sole use and exercise for fourteen years of his invention of improvements in machines for propelling vessels and other machines capable of being propelled by steam. MS 1094/ACC 1931-006/386915 15 October, 10 Geo. IV 1829. 1832 Locomotive steam carriage. His first patent for locomotion is dated the 9th February, 1832. 1835 Listed as 'Church Dr. Green lanes'. 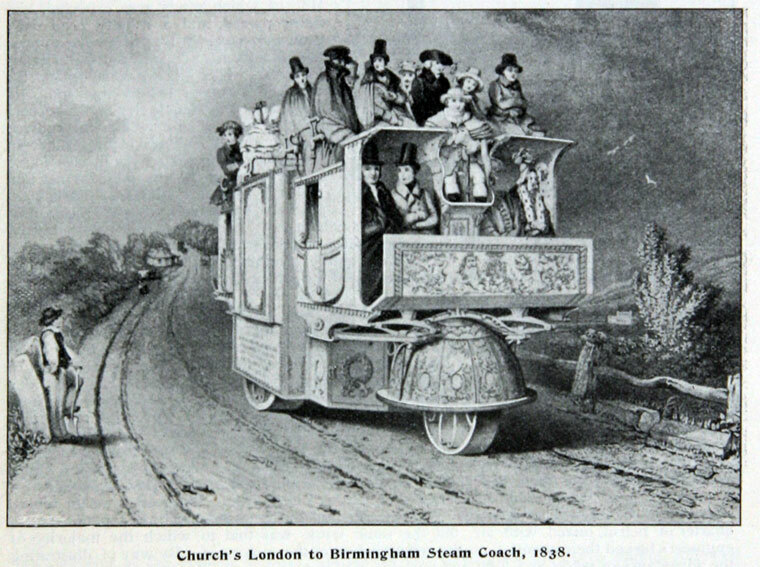 1835 Built an omnibus to carry 40 passengers for the London and Birmingham Steam Carriage Co.
1838 Built a locomotive to run on the London and Birmingham Railway. 1840 June. Listed as William Church, Aston, near Birmingham, civil engineer. 1840 September. Patent. 'William Church, of Birmingham, civil engineer, for improvements in fastenings applicable to wearing apparel, and in apparatus for making the same and like articles, and also in the method or methods of preparing the said articles for sale'. 1840 November. An accident caused by a boiler explosion at Bromsgrove Railway Station, designed by Dr. William Church and built three years previous by Joshua Horton of Brierley Hill. Two killed. 1841 Listed under 'Engineers' as 'Church William (civil), 98 High Street, Bordesley'. 1847 September. Haywood House, Bordesley Green to be let, the former residence of Dr. Church. 1861 November. Letter regarding the gun that Dr. Church and the writer (S. A. Goddard) produced five years previous. The late Dr. Church. Born in Vermont and educated for a medical career. 1811 Patent for a screw propeller. 1818 made a brief visit to England. Second visit in 1822 to construct a printing press of his own design for 'Britannia', Lancaster Street. 1825 invented a mode of smelting iron by hot blast and anthracite coal. 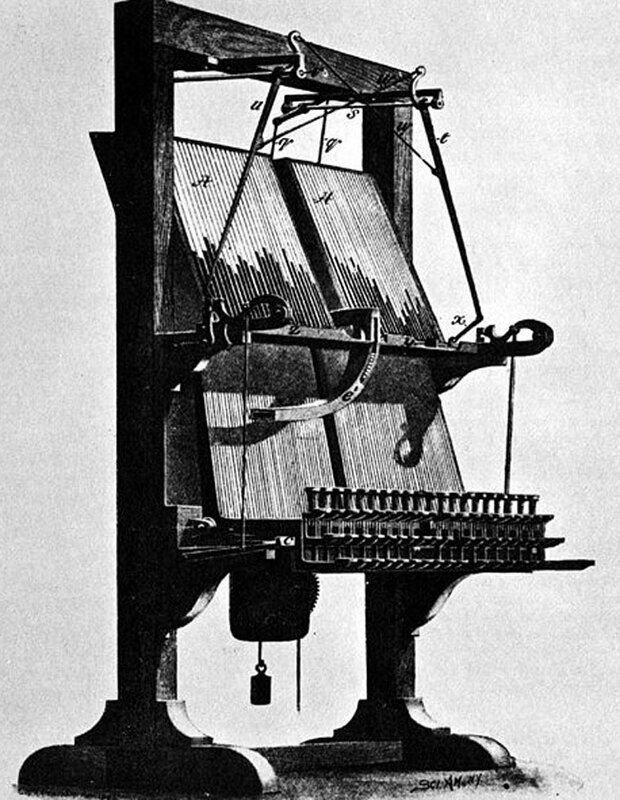 1825 onward inventing and constructing machines for making spikes, nails, button shanks, hooks and eyes, etc. Built a steam carriage under the supervision of Mr. Wakefield, Senior, now of Harford street. Built a railway engine to his own plan. Invented a railway ticket machine. 1832 proposed to lay down wires to London and to communicate by electricity. Of late years he invented and constructed with the help of Mr. Higgins of Moseley street, a breech-loading cannon. Took out about seventy patents. As soon as the mechanical difficulty was solved he tended to lose interest in a project. Twice married, the last time in Birmingham, he survived his last wife by twelve years. Five years ago his son-in-law in Vermont invited him to spend his remaining years with him and with the aid of a borough councillor and a few friends was enabled to go. The Doctor never accumulated any money. Steam Locomotion on Common Roads by William Fletcher. Published 1891. This page was last edited on 3 August 2016, at 14:16.